It’s the 28th of the month, which is the March Shop Update for the Kelly Purkey shop! The theme for this month is food - and there are so many great products to get your favorite foods/meals documented. Here’s my traveler’s notebook spread using the March Traveler’s Notebook kit, Food Journal. I documented my favorite meal - Sunday brunch. I’m trying a new format with the traveler’s notebook layouts this month with an album from Citrus Twist. I posted a video of this layout coming together in my Instagram highlights, if you’d like to see it. 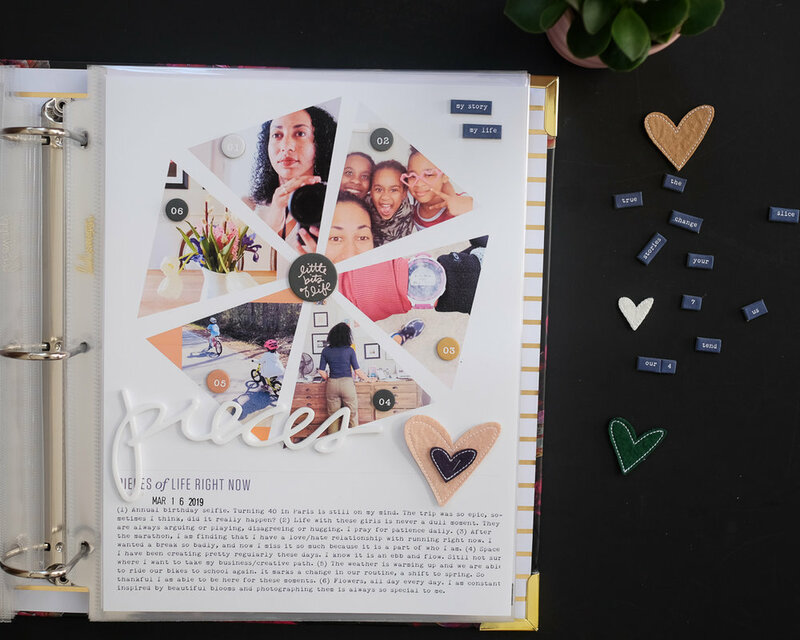 And here is my project life layout using a mix of products from this month’s release. For this layout, I used the very versatile Alberta and Irvington alpha stamp sets. I also used the Happy Hour stamp set, Life Love Paper Mini Kit: That’s Bananas, and the March Project Kit - Eating Out. This year, I’m using this 6x12 album, and Design H page protectors. And if you love coffee or tea, be sure to grab the Cup of Comfort stamp set. Be sure to share with me what you create. I’d love to see it! 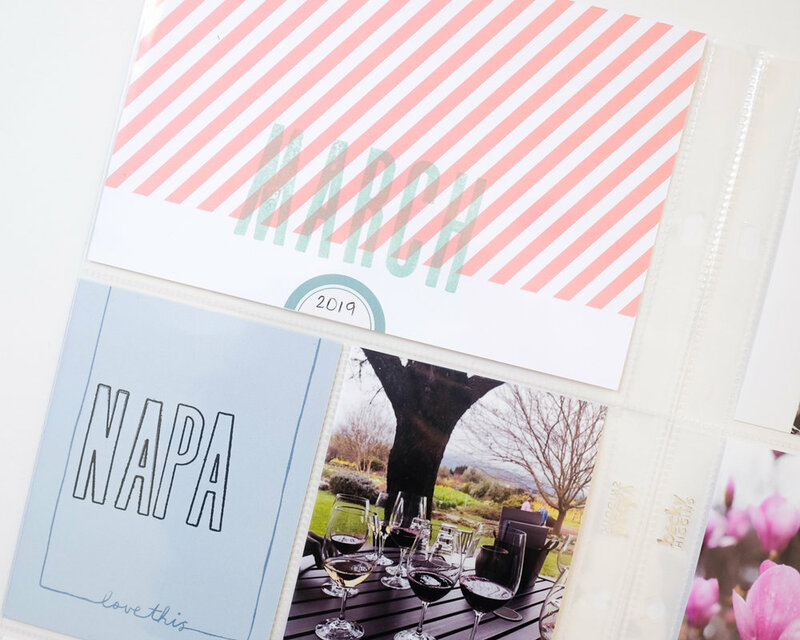 Month after month, I am constantly inspired by Ali Edwards’ Story Kit subscription. 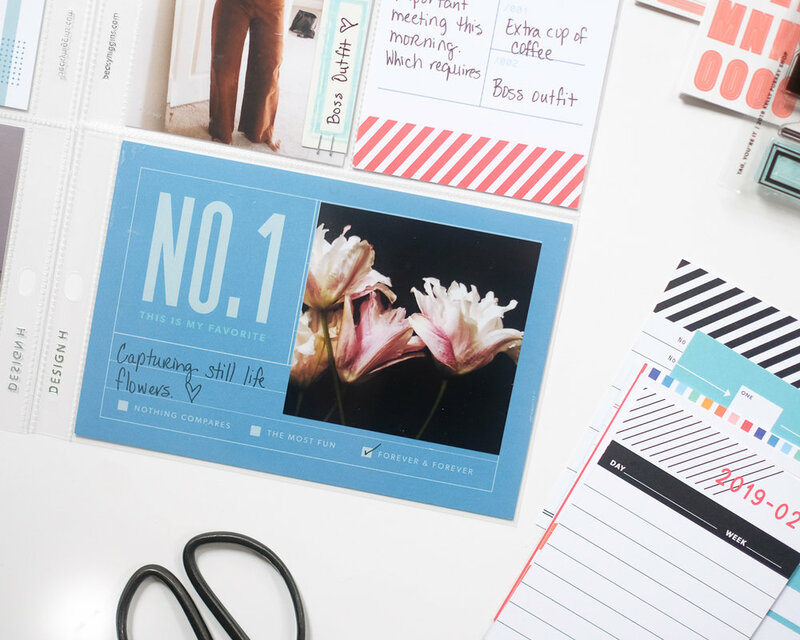 Each kit is so thoughtfully curated for you to document your story. I downloaded one of the bonus digital templates included with the subscription and resized it to 8.5 x 11 inches in Photoshop (this is the size of all my story kit layouts). 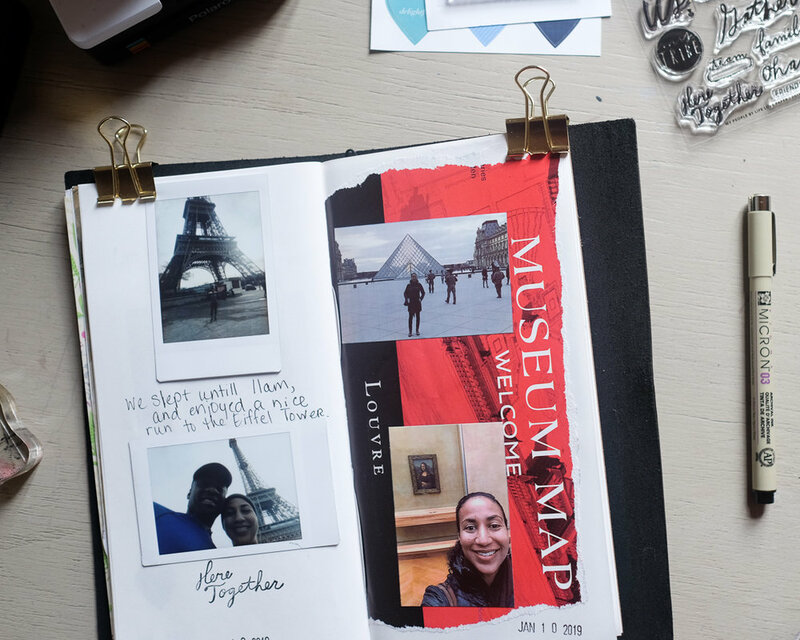 I added my photos and journaling about 6 things, or pieces, that currently make up my life right now. After printing, I added a few embellishments from the kit and stamped the date - everything coordinates perfectly! As always, I love how much I am able to dig deep and tell different stories than I capture in my project life layouts with these kits. Products used: Ali Edwards Pieces Story Kit Subscription, Heidi Swapp 8.5 x 11 dark floral album, Epson Semi-gloss photo paper. You can see all of my story kit layouts here. This year, I am sticking with my formula of letting the photos tell the story. I love including my recent film images in my album. I find that I am always drawn to shadows and light, and that’s what I wanted to document in this spread. 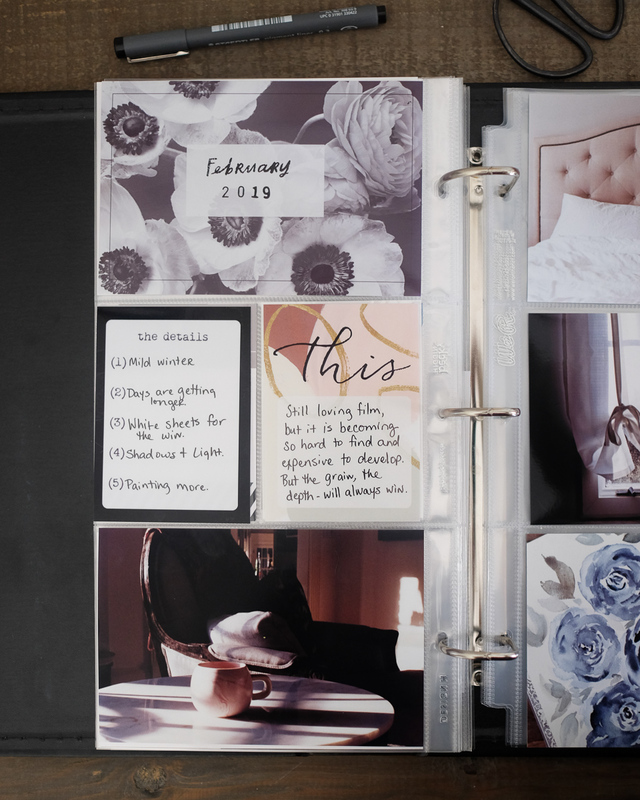 For this spread, I used journal cards from my Anemone Collection to document the date and a highlights of this spread. I also used Tina’s months stamp set for “February” andthe Twenty Nineteen stamp for the year. Simple images that tell a story wins every time for me. All photos printed on my Epson Picturemate PM-400 using Epson Semi Gloss photo paper. 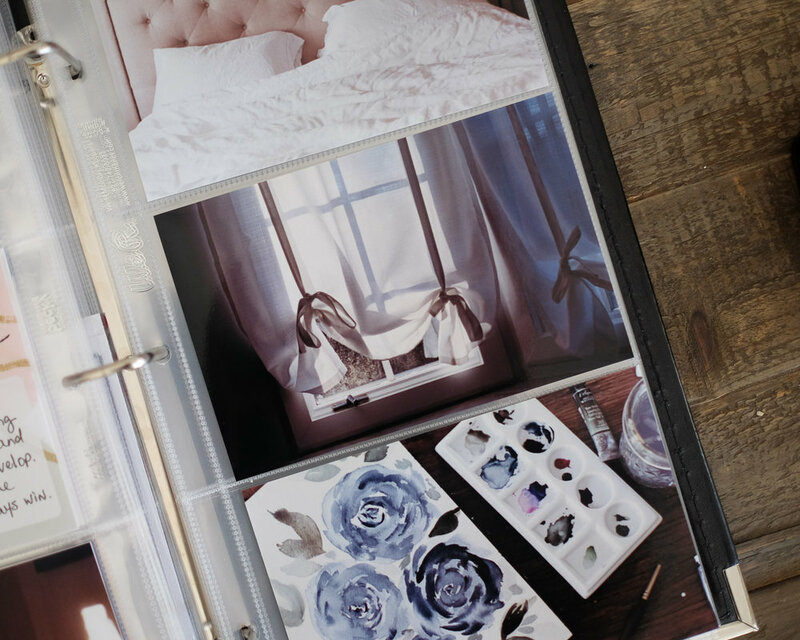 I’m also using a black 6x12 Album by We R Memory Keepers I purchased a while back, similar option here. Page Protectors are Design H and 6x12 protectors, 4x6 inch pockets. The February shop update for the Kelly Purkey Shop is available today! There are so many good products included in this release - including the Wonderful Women stamp and Girl Power. Here is a look at my layouts with the new products this month. 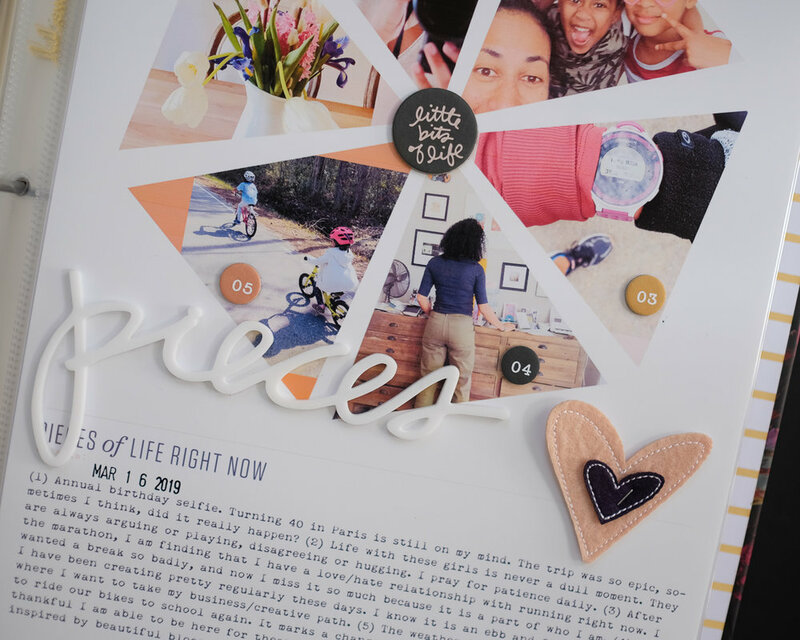 For this 6x12 inch project life layout, I used the new project kit, Tag You’re It. I love all of the blues and corals that are included in this kit. Also, the stamp set is perfect for adding details to your layouts, or creating your own journal cards. I’m using this 6x12 album, and Design H page protectors. I used two more stamp sets to document in my traveler’s notebook. I’m finding that I’m a bit more playful in this space, and I love how easy it is to create a layout when you are not restricted by page dividers, just space to create. 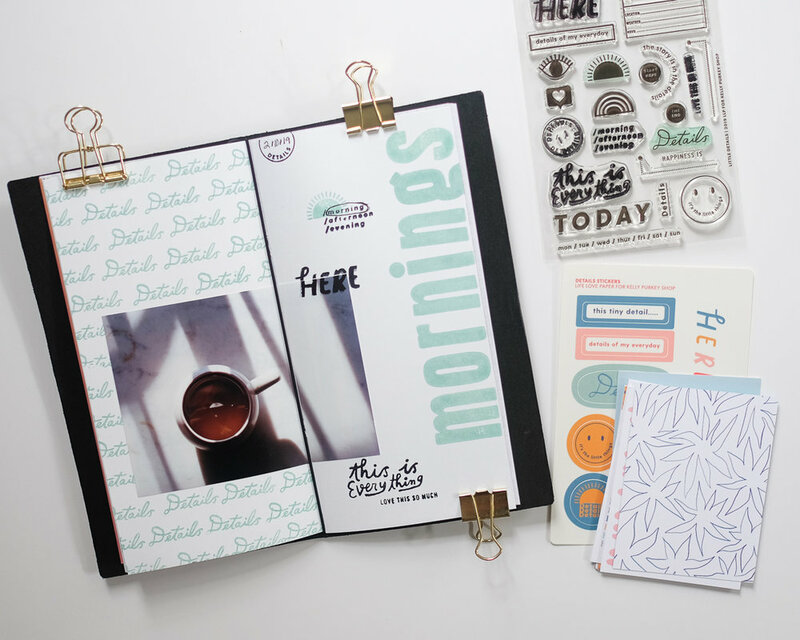 The Little Details kit by LifeLovePaper is perfect for documenting my morning cup of coffee, recently captured on film. I created my own travelers notebook inserts for this layout, using the “Details” stamp and the XL Park Slope alpha stamp set. And finally, if you only get one product in this release, I would definitely get this one - OK Ladies. When I saw the face stamp, I immediately knew I wanted to make a few brown faces for journal cards. I used a bit of arcyla gouache paint for the faces and definitely went a little a little overboard with the stamping, but it was so much fun to create custom cards. Definitely keeping these handy for a future layout. Let me know what you decide to get from the February release! You can see the rest of the creative team release in the idea gallery. 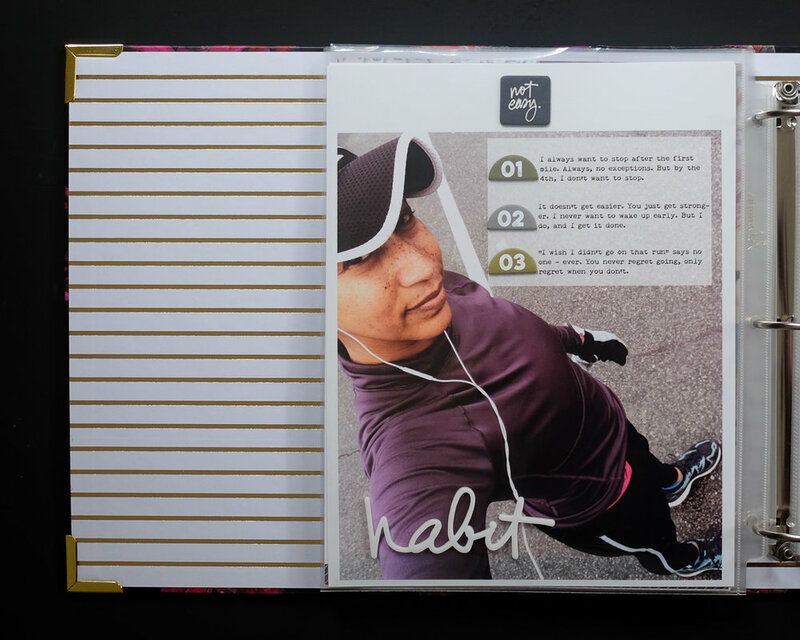 When I received last month’s Habit story kit from Ali Edwards, I knew exactly what I wanted to document. 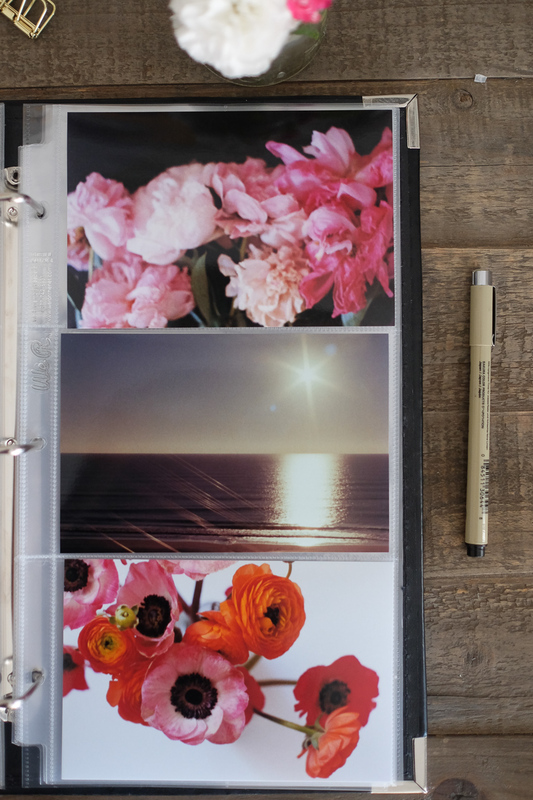 I am using this beautiful 8.5 x 11 dark floral album in the photo above to hold all of my story kit layouts. 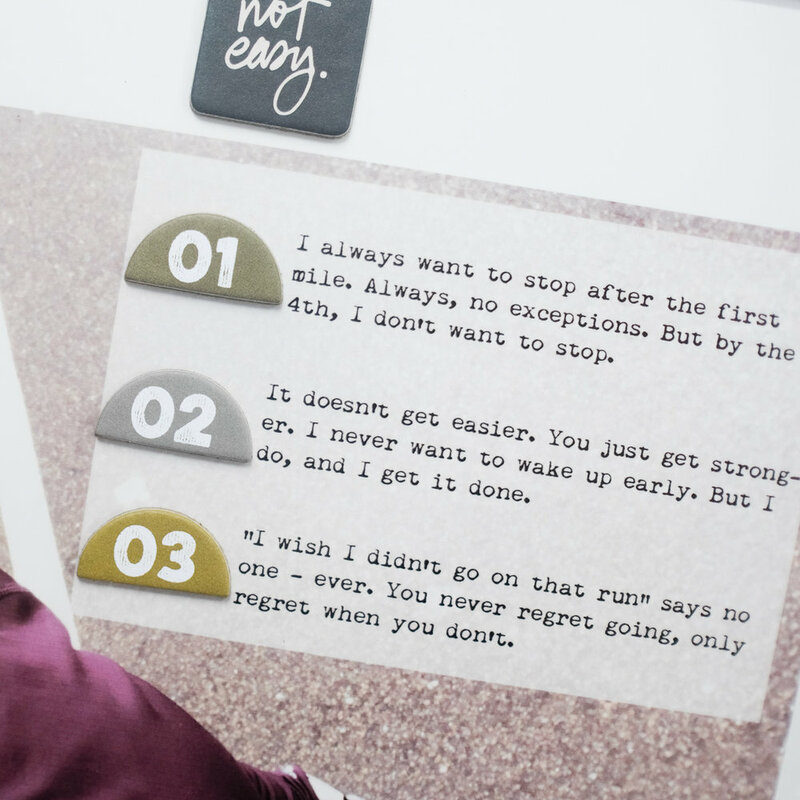 Here’s a look at what I created with the Habit Story Kit. Ever since the birth of my 3rd daughter, I have incorporated running into my life. I run three days a week. It is definitely a habit now, like brushing my teeth. It is a part of who I am. Every decision I have made in the last 5 years has been on a run. But it definitely isn’t easy. It’s a choice I make, and something that I am committed to doing. In Photoshop, I added a white box over my photo added journaling directly on top. I adhered “habit” on the bottom left hand corner and used a few embellishments from the kit to finish up the layout. Here’s how it looks in my album. On my trip to Paris, I decided to try something a little different. 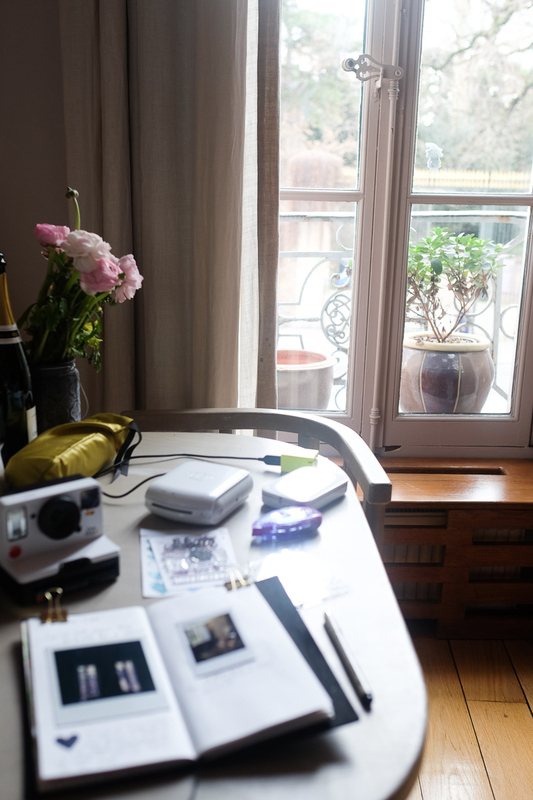 Instead of waiting until I returned home, I decided to bring along some essentials and document while traveling. Kind of the best of both worlds - memories documented without the stress of having to do it when I returned home. 1. The airplane folding tray was just enough space to create. I didn’t intend to use the airplane folding tray as a space to create, but I was so excited to get started. As it turns out, the airplane folding tray is the perfect size. I was able to write down my feelings and intentions about the trip. Be sure to pack your supplies in your carry on bag. 2. Limiting your supplies makes you more creative. I know it sounds counterintuitive, but when I have my entire stash available, the decision making process about what to use can be daunting. By limiting my supplies, I actually used everything. Not once did I think, “I wish I brought ….” Instead, I made do with what I had. Here’s what I packed: Midori Traveler’s Notebook, Midori Blank Traveler’s Refill, small palette of gouache, travel paintbrush, black ink pad, date stamp, stickers, Micron journaling pen, Scotch adhesive roller, binder clippers, my current favorite Kelly Purkey stamps, Fuji Instax Share printer (I have an older version), and my HP sprocket. I was able to fit everything in one bag, which was perfect for keeping my supplies together. 3. Collecting ephemera during the trip can be fun. I really enjoyed picking up ephemera at every place we visited - visitor maps, business cards, receipts, ticket stubs. Usually these things are cumbersome for me collect on trips because I know I have to keep track of them in order to get them home. And they add up quickly! I found that I didn’t mind collecting ephemera because I knew I would be using them soon. 4. Finding a quiet space to journal is essential. As soon as we got to our apartment, I made sure to find a space that I could spread out and create. It turned out to be this little desk near a window that was perfect for holding all my supplies. At the end of each day, I simply returned to this little area and documented our excursion for the day. 5. Anything is better than nothing. 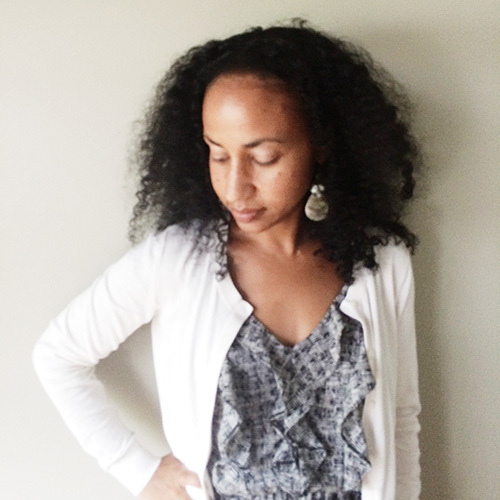 I realized I could let go of any preconceived notions about perfection. Anything I documented that day would be better than nothing at all. I wasn’t concerned about things matching or how they looked together. I was simply able get my thoughts and pictures documented. And if you are interested, here is a short video of my complete January traveler’s notebook. 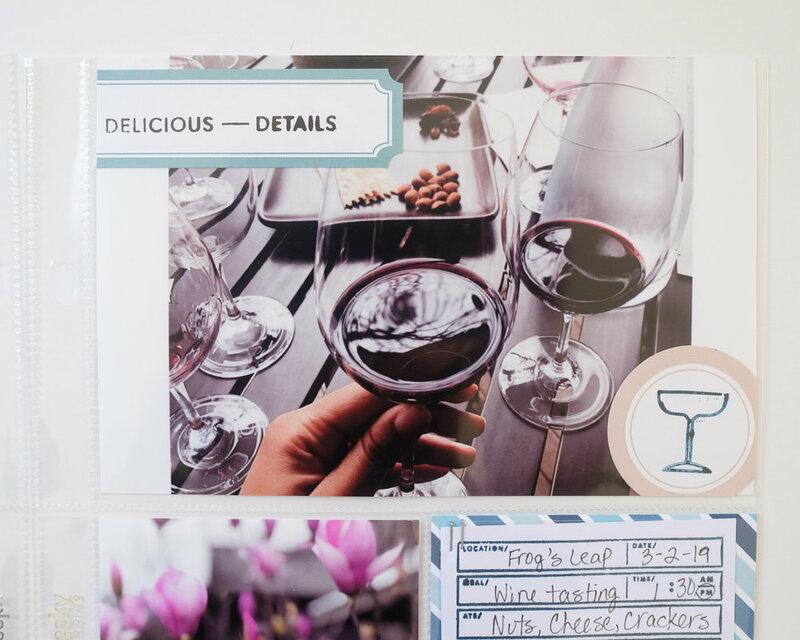 Sometimes I love combining words + photos in my project life layouts, and other times I like the photos to tell the story. 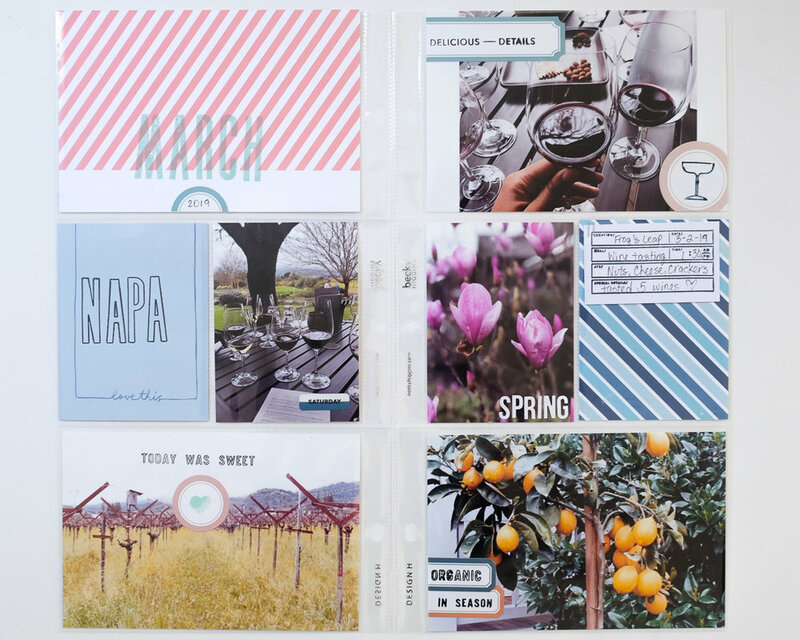 I included only two journal cards from the Fresh Start Documenter Kit by Studio Calico. And if you’ve been following me for a while, you know that I love to include film in my layouts. For this spread, I printed out three 4x6 inch prints of my favorite film images from my most recent 35mm roll. I combined them with two photos from my week and I love the simplicity. No fancy embellishments, just the photos. If you find yourself at a loss for words, allow your photos to tell the story. All photos printed on my Epson Picturemate PM-400 using Epson Semi Gloss photo paper. 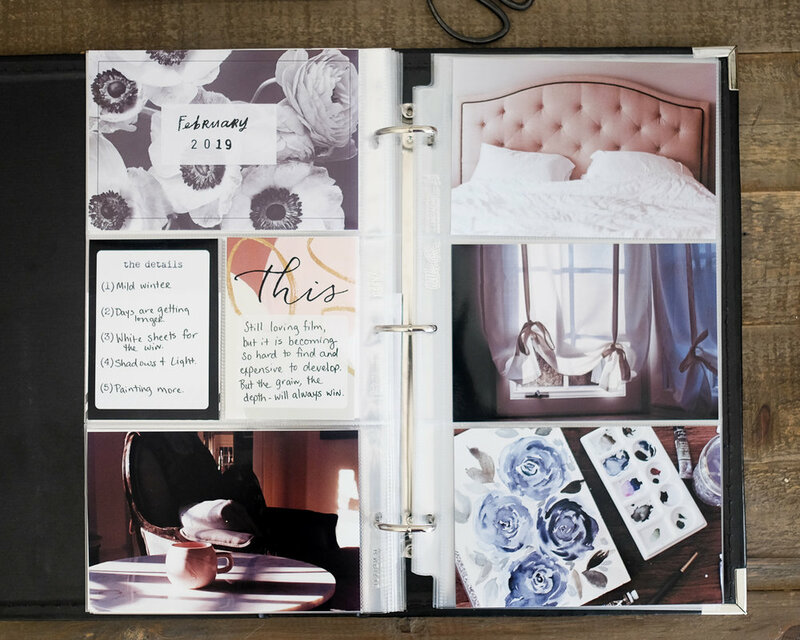 I’m also using a black 6x12 Album by We R Memory Keepers I purchased a while back, similar option here. Page Protectors are Design H and 6x12 protectors, 4x6 inch pockets. 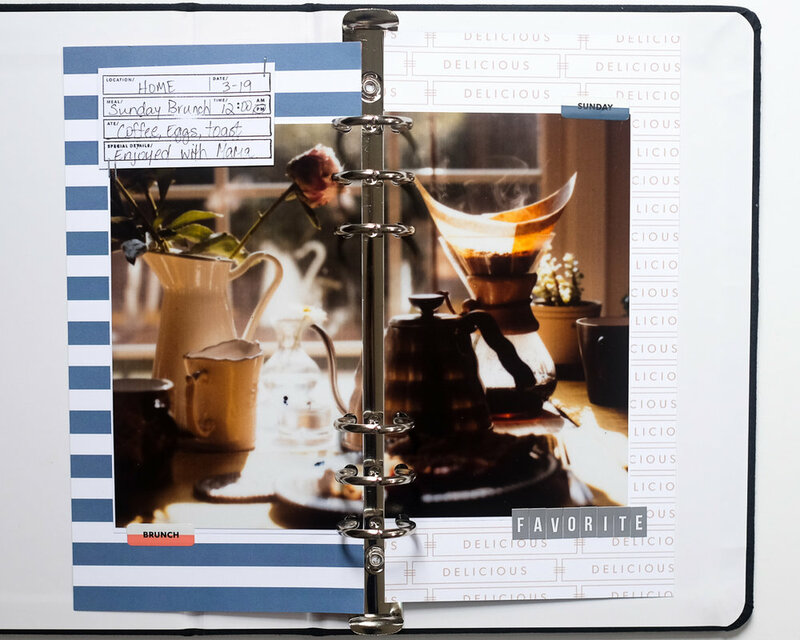 Journal cards are from the Fresh Start Documenter Kit by Studio Calico. Excited to share that I am on the 2019 Kelly Purkey Shop Creative Team! I absolutely love Kelly’s products, and I am looking forward to combining the beautiful stamps and paper with my images each month. The January shop update is available today! Here is a pocket page layout I created with the January kit called “Birthday Wishes”, perfect since January is also my birthday month. My husband and I spent the week of my birthday is Paris this year. It was a magical trip, and I can’t wait to share more images soon! I chose a few of my favorite photos to pair with the journal cards, stickers, and stamps. I love the baby blue alphas in this kit, and how they pair so nicely with the pinks and corals. I’m just a couple of weeks in, but the 6x12 format is working nicely for me. I am using this album, but in black, and Design H page protectors. I also included “the future is bright” 3x8 pattern paper from the “This Year” mini kit, also in this month’s release. My polaroids from this trip came out so dark and moody. Not the best, but combining film in my layouts will always be my love language. And the stamps! Love how this “oui”, included in the True Love stamp set, was perfect for adding a little bit of French in my layout. I used the Brooklyn Heights alpha stamp for “Paris”. I’m looking forward to sharing my projects with Kelly Purkey Shop with you this year!